Review: Dan Cahill and his sister Amy live with their great Aunt Beatrice in a tiny apartment. Their grandmother, Grace, recently passed away. Amy and Dan are hoping that they will inherit the mansion and fortune. But, at the funeral, people, and only certain people, have tickets in their program, enabling them to inherit part of Grace’s fortune. Amy and Dan are overjoyed when they get tickets. They aren’t so happy when the Holts, Kabras, and their celebrity cousin, Jonah Wizard, also get tickets. But, there is a twist. Mr. McIntyre tells the inheritors that you can either take the money, one million dollars, or you can get a clue to a very dangerous quest involving all 4 branches of the Cahill family: Lucian, Tomas, Janus, and Ekaterina. 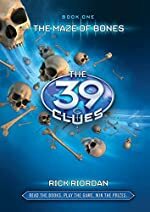 The 39 Clues: The Maze of Bones is very much like The Amazing Race, just much more dangerous. Also, it is somewhat humorous. It resembles The Amazing Race because the main characters get to travel around the world, solving clues and facing dangers. It is a much more dangerous version of The Amazing Race because there is poison, dart guns, and concussive bombs! It is a quest that means life or death for the family. It is very exciting, and it keeps you on pins and needles. If you have plans for putting this book down, you may as well cancel those plans because you just can’t find enough will to. Even if you had all of the will power in the world, you wouldn’t have enough! The plot of the book is very well thought out, and it is a book that you can read if you are in 3rd grade or if you are a young adult looking for an adventurous read. Also, if you want a quick read that is really exciting and fun, I recommend this amazingly fantastic book. You won’t be disappointed at all! All in all, I give this book 2 thumbs up! If I could, I would give it 10,000 thumbs up, but I don’t have that many thumbs. Review written by Brittany, Grade 6. Date of review: October 2008.
Review: Competition, mystery, and near death experiences, what do these have in common? A tremendous book called The 39 Clues: The Maze of Bones written by Rick Riordan, and the first in its series. It has a very intriguing story line that made me want to keep reading and never stop. I think this would be great for any younger reader. Dan (11 years old) and Amy (14 years old) live with an au pair because their parents died in a fire leaving their Great Aunt Beatrice as their guardian. Every weekend, Dan and Amy go to the Cahill Mansion where their Grandmother Grace Cahill lives. In the beginning of the story Grace dies and she selects a few family members, including Dan and Amy, to hear her will. Grace’s will gives the people in the room two choices, either enter a dangerous competition which will be completed when 39 clues are revealed or have a chance or take a million dollars each. If Dan and Amy choose to enter the competition they could end up being very influential people, but they will be disowned by their aunt because she doesn’t want them to take the challenge. But, Dan and Amy take the chance of dying and enter the contest. Their rich and dangerous cousins, aunts, and uncles take the challenge as well, and they all get the first clue. The family members compete against Dan and Amy because they don’t want Dan and Amy to get the power. Although the family members compete against one another, they mainly target Dan and Amy, but will kill each other if it becomes necessary. What will happen next? Will they survive the challenge? This book deserves 5 out of five stars because the book is very intriguing and made me want to keep reading. The author described the setting and the thoughts of the main characters very well. For example, the Cahill mansion was very well described with all the details about the inside and outside during the funeral. The author also did a good job in describing the important characters physical appearance. It is difficult for me to find anything I did not like about this book. Overall I recommend this to any younger reader from third to seventh grade, however everyone would enjoy reading this great book. Review written by Kevin, Grade 6. Date of review: February 2010.
Review: What would you do if you were at your grandmother’s funeral and you had the choice to take one million dollars from her will and walk away? Or, you could take a clue that could lead you to being the most influential human being in the world, or lead you to death. Dan and Amy Cahill take the first clue and begin the adventure of their lives. These are the events that begin The Maze of Bones, the first book in "The 39 Clues" series. This book was written by Rick Riordan, but I find it interesting that each book in the series is written by a different author. The book is a mystery written in today’s world. Dan and Amy Cahill are the main characters of this story, Dan is 11 and Amy is 14 years old. Dan and Amy Cahill are at the will reading during their grandmother’s funeral when they learn that their family is the most influential family in history. Amy has reddish brown hair and, like Dan has green eyes “like jade”. She also gets very nervous and tongue-tied around other people, especially crowds. I like Dan very much because he is a lot like me. He has dark blond hair like I do and he loves to collect things. He has a photographic memory and Amy thinks he is a huge dweeb. They begin a race to find the first of 39 clues which could lead them to either great power or certain death. Making enemies of fellow family members along the way, their many obstacles include when a library explodes with them inside, and other competitors stealing their leads. The author wrote the story very literally which I liked because I might not have understood some parts if he had written the book with figurative language. The book is written as if it was really happening in our world today. The plot is very interesting; he made it seem as if you are there with them and you know what they are thinking. Rick Riordan filled the genre very well; he had everything a mystery novel needs to be great; suspense, intrigue and excitement. When I read the first chapter I was slightly confused as to what was happening, but that only made me want to read on, so it had an effective hook. The author described everything with phenomenal detail so I had a clear image in my mind at all times. The book is very well paced; it is not too slow or too fast the entire time, and it varied in speed appropriately throughout the book. The ending is written as a cliffhanger which well prepares the reader for the next book. Overall, the book is fantastic. Despite the fact that the author did not use figurative language, which I felt was not needed; I gave the book 10 out of 10. Readers of all ages will love The Maze of Bones. Review written by Noah, Grade 6. Date of review: January 2011.